Mary Romero is a Professor of Justice and Social Inquiry at Arizona State University and President-Elect of the American Sociological Association. She has published articles on race, immigration, and law, and her most recent book is Introducing Intersectionality (Polity Press, 2017). Eric Margolis is a visual sociologist and the author of numerous works on the hidden curriculum in higher education. 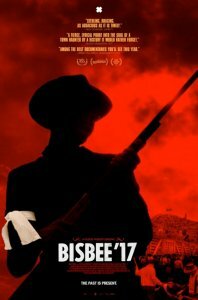 Bisbee ‘17 is a documentary about an Arizona town facing its ghosts. In June 1917, when copper miners organized by the Industrial Workers of the World had gone on strike for two weeks, 1200 striking workers were rounded up and “deported” to New Mexico. The owner of the mine, the Phelps-Dodge Company, also owned the hospital, department store, library, newspaper, main hotel . . . in other words, Bisbee was a company town. In 1917, everyone had been forced to take a side, and only those on the company’s side remained in Bisbee. Like many towns with one employer, family and community were torn apart by the strike and deportation. One hundred years later, as the film shows, the town reenacted the event. Unfortunately, viewers will learn very little about the historical event from the film. Instead, we witness the former mining community recreate an event from the pseudo memories of transplants to Bisbee and the grandchildren of deported miners and armed deputies who rounded-up strikers and their families. Residents play the roles of strikers and deputies, reenacting the armed capture of peaceful strikers who were herded into the ballfield and then stuffed into freight cars. As the community planned for the one-hundred-year celebration of the Bisbee Deportation, they chose a path common to American historical sites: create art, sing songs, and stage the event as a tourist attraction. The film shows community members trying to understand both sides: miners striking for more pay and safer working conditions and others who argued the company’s perspective — that the IWW threatened the war effort as well as the livelihood of the town. To capture all sides, the usual tropes prevail. The “Mexican family” is represented by a young man whose mom was deported to Mexico when he was seven and who “nurtured himself” growing up. The woman posing as his mother in the enactment is a Republican Country Clerk who views her acting as “kinda like a novella.” However, labor history is not a soap opera. Bisbee ‘17 shows us how the reenactment can be cathartic as town therapy, but a closer look at Arizona’s recent history of deportation shows the ghosts were not exorcized. The Bisbee Deportation has been well documented in newspaper articles; local, state and federal government officials’ correspondence; and court proceedings from law suits filed by the deportees and charges against participants in the deportation. Sheriff Harry C. Wheeler had deputized the Citizens’ Protective League or Loyalty Leaguers to roundup strikers, strike sympathizers, and others from their homes, restaurants, stores, and on the street. On July 12, 1917, they were loaded onto twenty-four cattle and box cars and sent to Columbus, New Mexico, where they were met by armed guards who kept them from detraining. The box cars of people were then taken to Hermanas, New Mexico — all without adequate food or water. Later they were returned to Columbus, held by military authorities, and eventually released, but not allowed to return to Bisbee. Civil and criminal suits were filed against the Phelps-Dodge, persons involved in the kidnapping, and the El Paso and Southwestern Railroad for providing the trains for the deportation. A financial compromise was reached, and no trial was held. Although both federal and state charges were filed against the sheriff and government and business officials for their participation, no one was punished. The labor history of the Bisbee Deportation may have been forgotten by current Arizona residents, but we don’t have to look back a century to find an Arizona sheriff deputizing a posse to assist in the deportation of unwanted immigrant workers. Maricopa County Sheriff Joe Arpaio, who held that post for 24 years, established the “illegal immigration operations posse” in 2011 to round up undocumented immigrants working in construction, landscaping, or restaurants as well as people who were walking or driving to home or work. Although Arpaio claimed these raids were “crime sweeps,” few of the immigrants arrested had criminal records. Along with county sheriffs, members of the posse participated in immigration sweeps targeting and terrorizing Latino communities in Maricopa County. Protests against the raids were met with same rationale as the “Law of Necessity” used to justify the Bisbee deportation: the immigration system is broken, the federal government is not responding, so the sheriff took control. Federal funding from ICE’s partnership initiatives to work with local law enforcement, the 287(g) agreement, lured local authorities across the county to participate in immigration law enforcement, moreover huge profits are being made by privately-owned detention centers. Over the last decade hundreds of immigrants were held in detention centers, separated from their families, and deported. Remarkably, the organizers of the Bisbee reenactment cast someone who had worked in the private prison and deportation industry to play the sheriff, linking the two events. Just as in the Bisbee Deportation, lawsuits were filed and eventually the class action lawsuit, Ortega Melendres vs. Arpaio found the sheriff had targeted Latino drivers and passengers in violation of the Equal Protection Clause of the Fourteenth Amendment. The court mandated changes that the sheriff ignored, and his posse continued to enforce immigration after losing the federal 287(g) agreement to work with ICE. Arpaio was found in contempt of court, but before he could be sentenced Trump pardoned him. Like Sheriff Wheeler, Sheriff Arpaio was never punished for his crimes. Trump’s policy of zero tolerance has deported many workers and broken up families, including many long-time residents, homeowners, and respected members in their communities. We have witnessed hundreds of asylum seekers deported without due process, families separated, and parents and children detained in privately-owned detention centers. Recently the Southwest Key Program, the largest private operator of shelters for migrant children, came under federal investigation for misappropriating government funds. Many still find deportation to be good for business. A century from now, will Arizonans stage another play about deportations? Will the actors and residents play migrants and ICE? Sheriff Arpaio and members of his posse? Will some play the parents and children separated at the border or dragged from their homes during the early morning? Will we, too, tell this story using a passive voice — “men died,” “life went on,” “mistakes were made”? Clearly, Bisbee and the state have not exorcised their ghosts. Trump’s pardon of Joe Arpaio, former Sheriff of Maricopa County in Arizona, was a major set-back for immigrant and human rights activists who fought to remove him from office in 2016. The pardon gives a pass for elected officials and police to violate the civil rights of Latinos, primarily low-wage working-class Mexicans.